Last year, I reviewed the Blackburn Flea headlight. 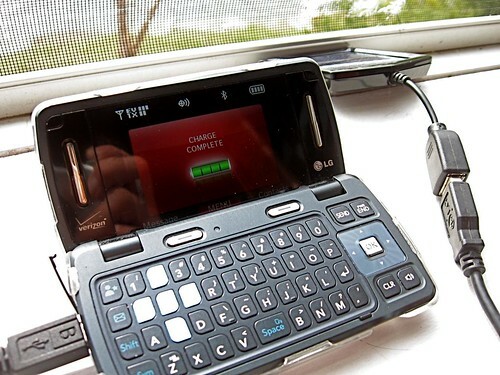 At the time, the only charging option was to use the small, portable and clever battery charger. 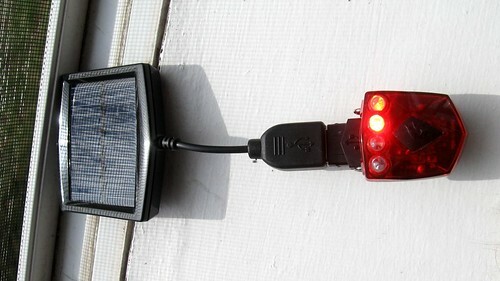 A few weeks ago, I got the matching tail light, which is now sold with an optional USB charger and solar panel. As tail blinkies go, the Flea gets serious points for being a single, sealed unit that’s small, rechargeable, and rugged. I don’t know how many tail lights I’ve lost because they fell apart after hitting a pot-hole. Functionally, the flea is run-of-the mill, however. It has a steady mode, a flashing mode, and a “chase” mode where it alternates from right to left. It’s brighter than most cheapo blinkies — as well it should be for the price, but it lacks the retina-searing dazzle of some other lights in this price range. The USB/Solar option adds a mere $10 to the MSRP of the tail light. For under $40, though, this diminutive blinky packs big gadget factor. The back of the solar panel is branded. This tail light is supposed to go 6-12 hours depending on mode. I’ve found that after 5 hours on steady mode, the light begins to get dimmer. I haven’t run it all the way down to see how long it’s actually usable. The USB dongle packs just as small as any of the flash drives you normally carry around, and it includes a keychain eyelet, so you can charge up at the office or at home with ease. The USB charger is compatible with both the headlight and tail light. When plugged into a USB port, it charges the lights much quicker than they’d normally charge from a battery with the old-style charger. My only criticism here is that the lights have to be removed completely from the velcro strap in order to charge via USB, whereas the light fits onto the older battery chargers without removing anything. 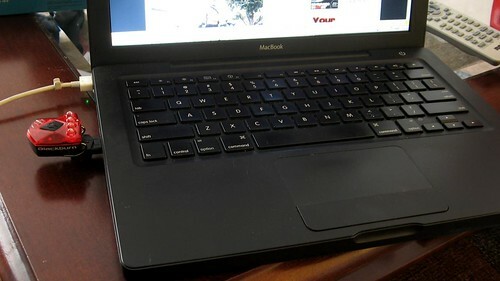 The solar panel provides a USB port. 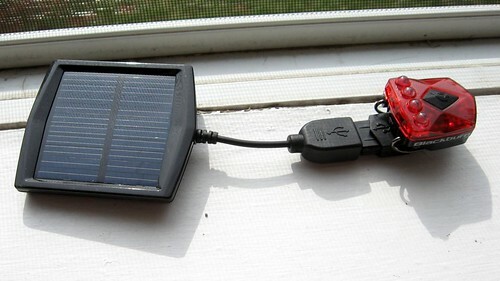 Harnessing the power of the sun to charge up is a nice option for people who go bicycle camping or touring. I’ve found solar charging to be slow-going, taking several hours of bright sun to fully charge the Flea. On a clear day, though, you would have no problems using the solar charger to charge both the headlight and tail light fully. While charging, a frequent, very dim flash can be seen if you look close enough. 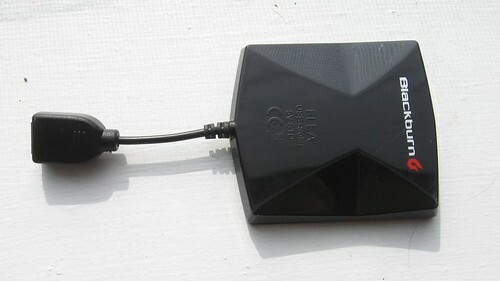 When done charging via USB (including solar), the flea blinks very brightly every few seconds. As a quick test, I plugged my phone’s USB charging cable into the solar panel, and it did charge it. Earlier this week, I left the charger in the bright sun for six hours, and it brought my phone up from 1 battery bar to three bars. My guess it it would take more than a day to fully charge a dead phone with this solar panel, but that’s not really what it was designed to do. It’d work in a pinch, though. For only an extra $10, this is cool. Did you ever find out what the maximum charge rate is for the Solar Panel? As well as the the bike lights, I want to charge my “simple” mobile phone (definitely not a Smart Fone!) and my Connect 7″ Notepad while on an Expedition from the UK to Spain. It will probably be blue sky and strong sunlight most days! The Mains /USB chargers that came with phone and notepad are 1000mA O/P. The Doro Phoneeasy 409 phone only takes an hour to fully charge from the mains or from a PC USB socket and the notepad 5 hours. I was wondering if I stood a chance in keeping them all charged while on the road and without having to use an AC Mains supply?